West of the Moon Gallery in historic downtown Flagstaff, Arizona continues to be one of the most respected galleries in town since opening its doors in 2000. 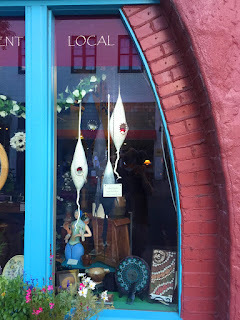 So I was thrilled when gallerist Carolyn Young offered to showcase my felted pods in her gallery window this past month. It is an honor to have my wool sculpture hanging next to the work of such amazing artists as Shonto Begay, Connie Townsend, Sarah Yeoman, Raina Gentry, and others! If you're in the area, you'll want to spend some quality time in this very special gallery!